When I moved to America I knew absolutely nothing about construction methods of buildings in the states. Not that I was an expert of Italian house construction, but I certainly knew a lot more about bricks and mortar than studs and sheet-rock. It has been one of the many learning experience for me and I had to start from the bottom. When I first heard that houses are kept up with studs, I had to look in the dictionary. Under “stud” the first definition listed was “a man who is virile and sexually active”. Another definition was “adult male horse kept for breeding”. 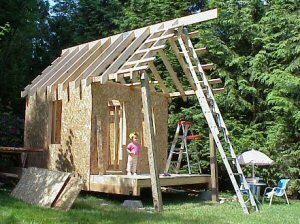 Before I saw the right definition (“scantling: an upright in house framing”) the thought that I was in a sexiest and shallow society that claims that virile man keep up houses passed briefly in my mind. When I realized that walls are made out of some kind of thin material I asked about it and I was told that it is sheetrock. The word materialized in my mind the image of thin layers of rock machined in super warehouses with huge wet saws slicing some kind of natural stone blocks. This strange scifi images (plus the alienating fact that “sheet” - see "An Italian in the States - part 4 - Language" - is one of these words that I tried to avoid as much as possible for a while) made me feel little like if I was born again and had to relearn even the most common knowledge facts. I finally understood why immigrants are also called “aliens”. I felt like one, in a sense. If you go inside an Italian house, old or new, and you touch the wall you’ll realize what all this difference that I’m talking about is. You can press as hard as you want or even punch or kick the wall really hard and it won’t move an inch. It’s rock solid. Literally! In “new” constructions (100 years old or newer) all walls, internal or external, are made out of bricks and concrete. They are then covered with plaster and painted or covered with wallpaper. 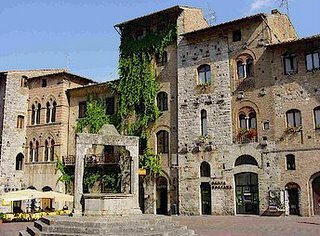 Older buildings, especially in small towns in the country, have solid walls made out of natural stone and they can be a few feet thick. If you were to stay in a house in Italy and you wanted to do even the simplest operation such as hanging a picture on the wall, you would notice how different things are. Forget tacks or large wood nails. For small picture frames you would have to buy tempered steel nails. These tough black nails are tiny (about 1” long), sharp like a knife and hard like… well… hardened and tempered steel! You hammer them through a layer of plaster and bricks or stone. Since they are so hard they are also brittle and often they bend or break in the operation. When that happens you need to pull out the piece left in the wall and try a new one. If you want to hang something heavier you need to use a good drill with a masonry bit. Lots of dust and noise later you would have to insert an expansion screw and tight it in. These screws are similar to some of the heavy duty sheet-rock fasteners that you use here in the States for heavy picture frames in cases when you don't have a stud in the right spot. When you tight these screws they expand in the wall and hold almost anything. If you thigh it too much the brick may collapse and you could find yourself with the dirty chore of patching a brick wall with newspaper and plaster… and lots of patience. If you ever wanted to put a new electrical wire in a wall you would be up for a challenge that very few homeowners take on themselves in Italy. You would have to cut what we call a “traccia”, or track. This is a 2” - 3” deep groove in the bricks. It is done with a jack-hammer if you own one, or with a hammer and brick chisel otherwise. Then you would have to put in an electrical plastic pipe and seal it in with plaster. After that you would have to resurface the wall, sand it and repaint. When you are done you would have to insert the 220V wire into the plastic pipe and hope that it doesn’t get stuck somewhere. Cutting these tracks produces a lot of noise and dust. 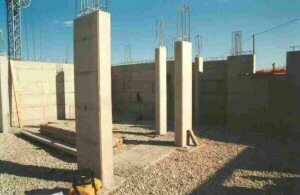 Speaking of noise; newly built condos in Italy have long concrete pilasters with metal rods in it going from the foundation all the way to the roof. These are very solid, but they also transmit noise very easily. When you cut tracks in the wall the noise and vibrations travel across these pilasters and invade people’s living spaces. For your neighbors it sounds like you are working in their house. When I moved to the States I couldn’t believe how weak walls are. You can easily go through a wall if you punch it (and you are lucky enough not to hit a stud). It took me a while to realize the anatomy of a house and when I found out that houses are kept together with nails, I couldn’t believe it. It was like somebody telling you that airplanes are kept together with scotch tape. Don’t take me wrong, I didn’t think it was a lie or some sort of conspiracy against me. I knew it worked, but I had to see for myself. That is when I built a playhouse for my daughter (see photo) following all the construction techniques and materials used in real houses (except for plumbing, which the only thing missing). Well, now I’m convinced. It works indeed. The playhouse is solid like a rock. All of this, I have to say, makes me think about the story of the wolf and the Three Little Pigs. But that, I realize, is probably a European story anyway.